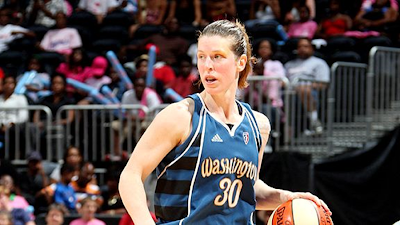 SEATTLE, Wash – Three-time Olympic gold medalist and two-time WNBA champion Katie Smith will join the Seattle Storm for the 2011 season following a three-way trade. In addition, the Storm acquired Jacinta Monroe, also from the Washington Mystics, and the Indiana Fever’s second-round pick in the 2012 draft. As part of the deal, the Mystics receive Jasmine Thomas, the Storm’s first-round pick this season, as well as Seattle’s first-round pick and Indiana’s third-round pick in 2012. Indiana receives Storm guard Erin Phillips and Seattle’s third-round pick in 2012. Smith, a 5-11 guard who celebrates her 37th birthday on June 4th, the same day the Storm opens its 2011 season against Phoenix, brings a familiar presence with a wealth of championship experience to Seattle. Smith and Agler won a pair of titles with the Columbus Quest of the ABL in 1996-97 and 1997-98. She has played with Bird and Cash on the USA National Team, winning Olympic gold medals in 2000, 2004 and 2008. Smith also earned a WNBA title with Cash when the pair played for the Detroit Shock in 2006. Current Storm assistant coach Nancy Darsch was also Smith's head coach at Ohio State during Smith’s collegiate career. Monroe, a 6-5 center, was the sixth pick out of Florida State in 2010. As a rookie with Washington, she played in 17 games, averaging 2.1 points and 0.9 rebounds in 6.9 minutes per game. A fractured left hand caused Monroe to miss 15 games. As a Seminole, Monroe set school records for career blocks (301) and games played (136) and was named to the All-ACC First Team as a senior. Smith and Monroe are expected to arrive in Seattle for the Storm’s training camp, which begins May 15.